This is a super simple recipe, and pretty much guilt-free as it's grain free and lower-glycemic (using the coconut sugar & honey). But be warned, this is a true "spiced" bread and goes perfectly with a hot tea or another hot beverage. If you're not much of a spice fan, I would hold back on some of the nutmeg, ginger, and clove as they give this Pumpkin bread that extra "edge". I also baked my bread in a larger sized bread pan, so when I sliced it it was almost like a biscotti size, just extra moist and chewy. -Line your Bread pan with coconut oil/spray, or parchment paper. You can of course use two small foiled pans to create more loaves. -In a medium sized bowl, mix together the dry ingredients (Almond Flour, spices, salt, baking soda, and coconut sugar) until everything is combined . -In a small bowl, mix all your wet ingredients (pumpkin, eggs, honey, and vanilla) until all is well combined. -Bake for 25-30 minutes, depending on your pan size and your oven you may need more time. -Serve warm, and any leftovers you have place in refrigerator as this recipe stores much better cold. 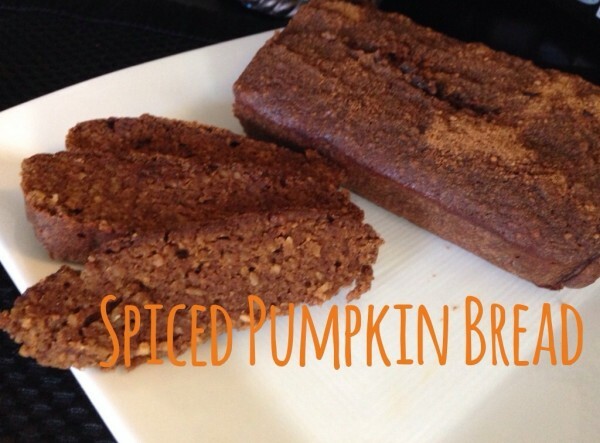 *I love eating this Spiced Pumpkin Bread with a drizzle of honey or almond butter. Enjoy with people you love, something warm to drink, and by the fire side!